Rinse, dry and trim as much visible fat from the corned beef as possible. Place it in your slow cooker cover it with water and sprinkle the seasoning into the water. If your brisket doesn’t come with pickling spice, McCormick makes a wonderful spice that is just as tasty. Cook for 5-7 hours until the corned beef is very tender. Mix horseradish and sour cream and place in the fridge until ready to eat. Serving size is 4-6 oz of corned beef and 2 Tbsp horseradish dip. 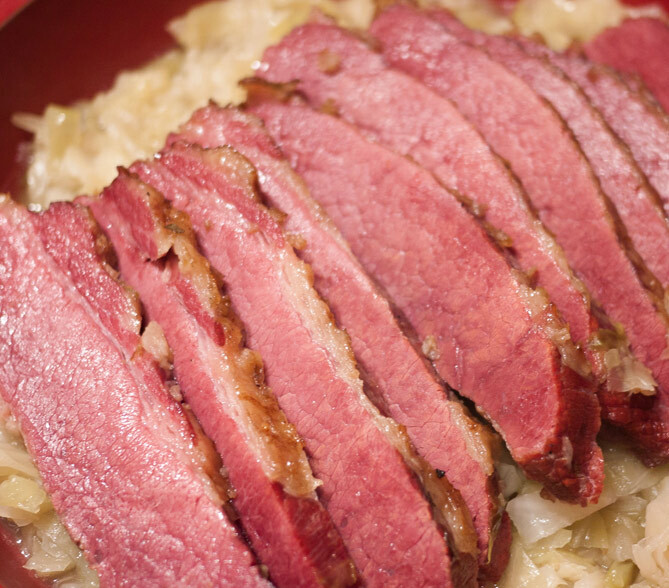 This entry was posted in Beef, Holiday, Modified Profast (Fast and Flexible) Recipes, Nutriplus Recipes (Balance Your Pyramid) and tagged cabbage, corned beef, easy, lose weight foods, main dish, roasting, saint patrick's day by foodies4mmc. Bookmark the permalink. Good for the Irish in you.